Visiting local restaurants is also a fun part of vacation, and we did a good amount of that, but it wasn’t practical for us to eat 2-3 meals out every day of our 6-day trip, so we did a lot of food preparation in the hotel suite kitchenette (mostly from food we brought from home). We ate out about 1 meal per day, usually dinner, and tried Ethiopian food, visited husband’s family’s old favorite coffee/breakfast place Fat Apple’s, and checked out a great grassfed burger place with tons of options for us like lettuce wraps and gluten-free buns (lots of ingredients from local farms). In the room, we put together breakfasts, snacks, lunch/dinner combinations that worked for everyone in our party (husband and me eating our own personal versions of Paleo, my mother-in-law with her specific preferences, and my little brother-in-law who is usually happy with anything we offer him). Since we drove down from Portland, we were able to buy a lot of food at a familiar grocery store near us, and supplemented with a few fresh things from the supermarket by the hotel. 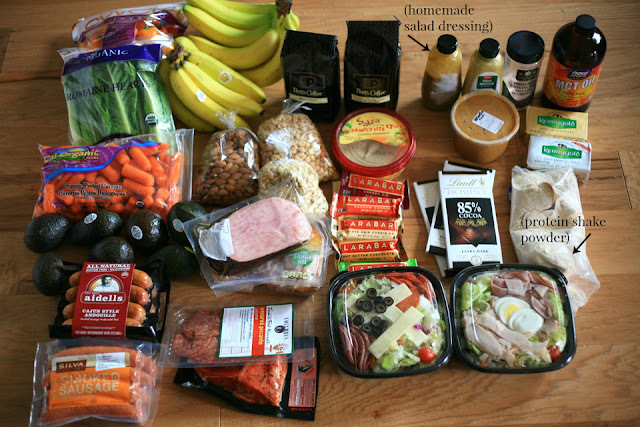 It’s hard to predict food needs for 4 people for 6 days, and even harder to try to plan ahead and stay within a tight budget (and stick to unprocessed, low-sugar, relatively high quality real food options). I think we did a really good job! So I wanted to share with you what we brought, what we relied most on, what worked, what meals we came up with. 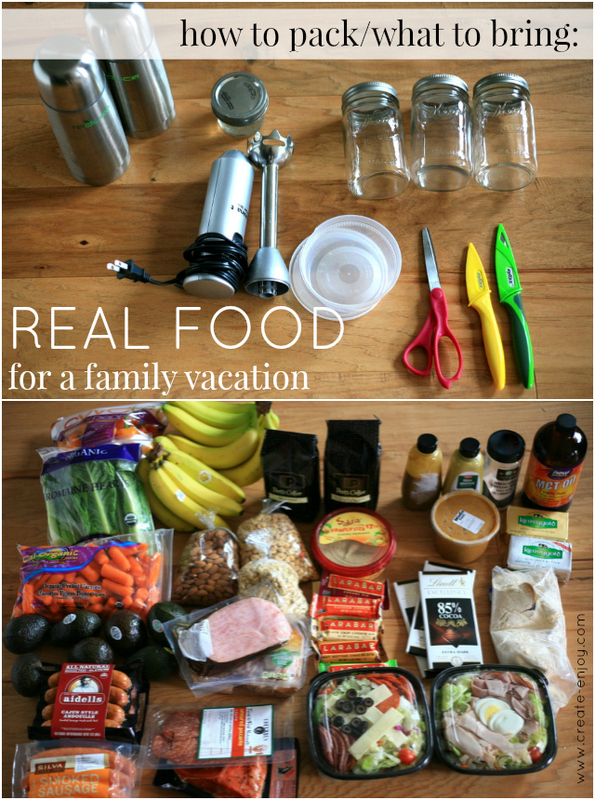 So here’s your visual guide: how to pack real food for a family trip! This guide is broken into 3 parts: what food to bring, what tools to bring, and combination/meal ideas. We brought fresh veggies, pre-cooked smoked sausages,bananas, nuts for snacking, cold cuts, smoked salmon, ground coffee, hummus, Larabars, salads for the road, homemade salad dressing in an easy-to-use container, mustard, salt, peanut butter, dark chocolate, MCT oil and grassfed butter for coffees, and protein powder in a smaller container. We definitely made some compromises for portability, ease, and fun, and I bought some brands and foods I don’t normally keep around the house. The sliced lunch meats, for example, are not the same quality we want from the meat we buy from local farms, and we don’t buy them except for picnic or travel situations. The Larabars are such a treat for husband and me, and good when mealtimes are unpredictable (I ate one on a shopping trip that ran long with my sister-in-law!). I thought about bringing my pre-mixed collagen peptides protein shakes for myself, but I didn’t want to bring the almond milk and yet another jar or bag, so I skipped those and just ate an extra couple of eggs! The whey protein shakes were helpful for husband and brother-in-law, though. We knew we'd be able to use the kitchenette in the hotel room, so we just brought some staples of our home kitchen: coffee mugs, dish soap in a small container (so easy to forget this one!! ), our stick blender, jars for mixing protein shakes in, an extra food storage container (handy for putting servings of nuts in or for keeping small leftovers), scissors for opening packages (sooo frustrating if you don't have them! ), and small knives with convenient blade covers. 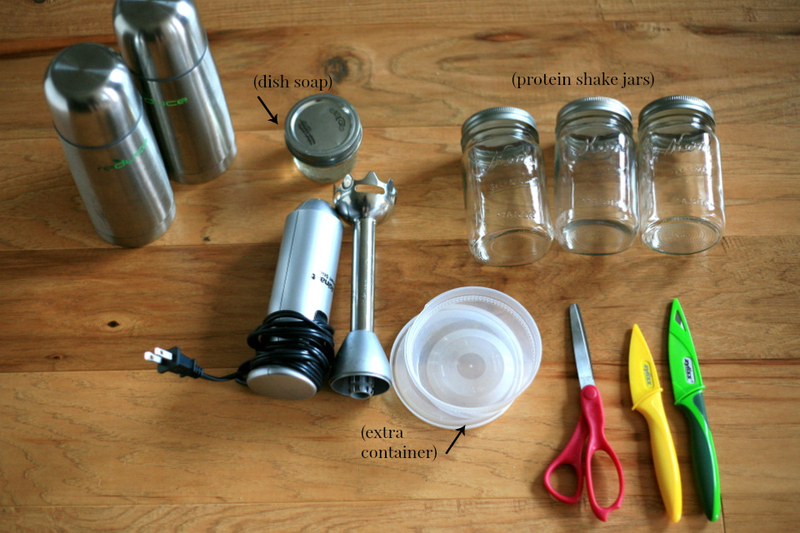 I wrapped the jars in a lightweight dish towel for traveling. We had a microwave, tons of cabinets, counter space, a convenient sink, 2 mini-fridges, and a dining table in our hotel suite, so we lived pretty comfortably and could do dishes and organize things as needed. We also borrowed (with permission) some tools from the hotel buffets (silverware, extra salt & pepper shakers). If you’re camping, you may not have as many resources and might have to pack more! We actually thought about bringing our regular blender for coffees, but car space was limited so we brought this handy stick blender and treated the large glass jar like a blender base. We had a pretty basic formula of acceptable meals for the most part. Not the most well-rounded nutrition we’ve ever eaten, but kept us full and clear-headed for a long weekend of long work days (husband and brother-in-law) and of tourist-ing and hanging out (mother-in-law and me). For almost every breakfast we had hard-boiled eggs, sometimes a smoked sausage heated up in the microwave, and coffee we made in the room. Husband made buttery blended coffees most mornings with the grassfed unsalted butter and MCT oil we brought from home. A favorite portable lunch-ey meal we’ve been doing recently for traveling is lettuce boats or cold cut wraps with mustard and avocado. Ham and avocado is a great combination! We also had the salami to add some interest for future applications of this recipe. The sweet peppers are a super easy veggie side. Here’s a salad I made with mixed greens (purchased at the supermarket near the hotel) and smoked salmon, peppers, and other goodies. While timing didn’t work out for a photo, also we had a tasty simple dinner of mixed green salads and smoked sausages. On the car on the way home I had a simple 3:00 meal of cold cuts, mini-peppers, and raw cashews. Because, traveling--tired of being on the freeway, sticking to simple things. At first the cooler and massive canvas bag of food and tools looked like too much, but we ate a good amount of it and now have identified what we had too much and too little of. We ate all the bananas and bought more toward the end, but we really overbought on the nuts, for example. We had 9 hard-boiled eggs left over, but that was okay since I didn’t have time to make my usual crustless egg and bacon quiche for my breakfasts for the week, so I've been taking eggs for my breakfasts at work this week. Hope this guide is helpful for you in packing for trips this summer! Whether you have food sensitivities or an autoimmune condition, are doing a Whole30 or 21 Day Sugar Detox, or just care about feeding your family nutrient-dense nourishing food, I hope you can learn from our trip!